The Hinkley Kingsley 3 light designer ceiling pendant in silver leaf finish features Regency grace and sophistication. Supplied by Elstead Lighting and designed by Hinkley. The Kingsley three-light pendant is a contemporary take on a traditional concept. It boasts a handsome strong symmetrical profile created by the three heavy cast scrolled braces that form the central body, suspended from a 178mm ceiling pan and chain finished in silver leaf. 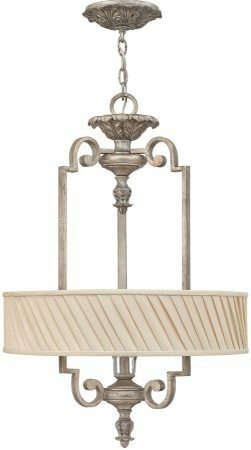 The ceiling mount, top and lower finials are decorated with intricate leaf detail and the wrap-around dark ivory twist shade is fitted with a glass diffuser for a softer light. A glass bobeche is fitted beneath the shade to add the finishing touch.